Lush, green houseplants create an inviting atmosphere that promotes relaxation and brings a room to life. When problems arise and foliage develops brown spots, it can be difficult to determine the cause. Plants often face difficulties in winter when air is dry and exposure to cold drafts or hot dry air from heaters is common. 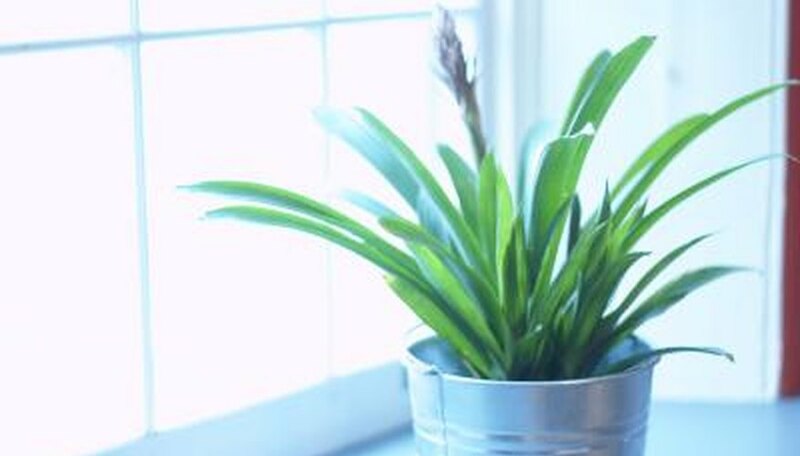 Combined with the low levels of light, particularly in northern climates, conditions are prime for problems with houseplants. Finding the cause requires troubleshooting to eliminate possible causes. Examine the foliage and take note of the size, shape and location of the brown spots. This provides valuable clues to the cause. Brown spots may appear on the margins of leaves, on the tips of leaves or as round or irregular spots in the middle of the leaf. Look for signs of underwatering, which causes brown edges, wilting foliage and drop of new growth. Place the plant pot in a bucket of lukewarm water and allow it to soak until bubbles stop rising to the top. This may take up to 30 minutes, depending on the size of the plant. Establish a regular watering routine. Check the soil for a buildup of white deposits created from overfertilization. Don't fertilize houseplants during dormancy or periods of decreased growth in winter, as overfertilizing can cause brown spots on leaves. Resume fertilizer in spring when growth resumes. Low humidity causes leaves to brown and become crispy around the edges. New growth dries up quickly and withers away. Provide adequate humidity by moving the plant away from heat vents. Place a pebble tray beneath the plant and fill it with an inch or two of water to increase the humidity. Keep the water level below the bottom of the pot. Plants placed on chilly windowsills develop brown areas if they touch a chilled windowpane. Although temperatures may be fine during the day, when temperatures drop at night, contact with the pane may cause browning. Move plants away from the window, especially at night. Never close drapes with the plant between the drape and the window when the weather is chilly. Plants moved to a sunny window may suffer from too much direct sunlight. Generally, leaves turn white or yellow from overexposure to light, but they may develop brown spots. Move plants away from direct sunlight, and gradually reintroduce them over a period of days or weeks. Plants affected by fungal leaf spot may appear speckled with darker spots in the center. This is usually a result of excessive moisture. Isolate the plant and provide adequate air circulation. Do not mist a plant suspected of having fungal leaf spot. Remove infected leaves and prune the plant if it is overly dense to allow proper aeration. The problem generally subsides without the need to resort to fungicides.